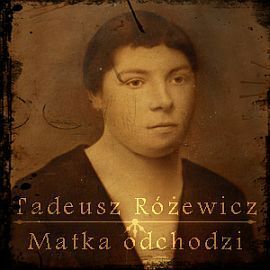 The book assembles photographs from the family album, some of his own poems, which are dedicated to his mother, a sketch with memories by the author's brother, Stanisław Różewicz, fragments of the author's diary and his mother's memoirs. Anna Frajlich writes of the book that while it is entirely focused on the family, "This book, which is entirely focused on the inner life of a family, is nonetheless also a reflection of a whole epoch. Through the family's experiences, the reader is taken on a journey which passes through some of the most important stages of the last century." Tadeusz Różewicz received the NIKE award, the most eminent Polish literary award, in 2000 for Mother Departs. Tadeusz Różewicz (b.1921) is an author who is impossible to categorise, whose work is unsettling, a poet who has turned to stillness and silence, who rejects poetic accessories and, it is tempting to say, a mystical writer. But he is also a classic author of the avant-garde, a precursor of postmodernism, a discoverer of inner experience. A poet whose long life has opened up to him the path to Mystery.